Clone your own gRNA into this vector and simplify delivery of hspCas9 and gRNA. As with all of our Cas9 delivery options, the EF1α-T7-hspCas9-H1-gRNA Plasmid is functionally validated and comes backed by our expert technical support team—if you’ve got a genome engineering question just ask by emailing tech@systembio.com. Even though gene knock-outs can result from DSBs caused by Cas9 alone, SBI recommends the use of HR targeting vectors (also called HR donor vectors) for more efficient and precise mutation. HR donors can supply elements for positive or negative selection ensuring easier identification of successful mutation events. In addition, HR donors can include up to 6-8 kb of open reading frame for gene knock-ins or tagging, and, when small mutations are included in either 5’ or 3’ homology arms, can make specific, targeted gene edits. 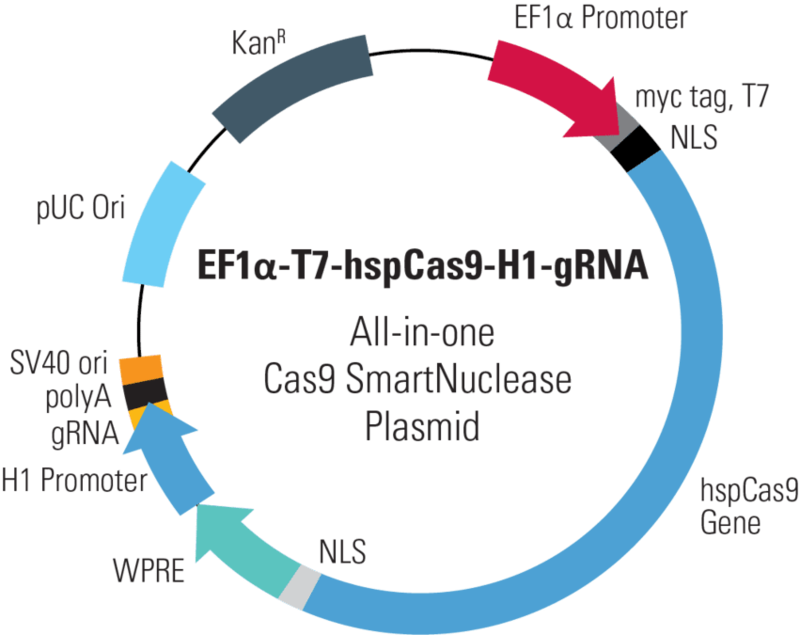 Not sure whether you need a CRISPR/Cas9 plasmid, purified protein, or mRNA? recombination, you can achieve efficient and highly targeted genomic modification with CRISPR/Cas9. Cas9 protein—uses guide RNA (gRNA) to direct site-specific, double-strand DNA cleavage adjacent to a protospacer adapter motif (PAM) in the target DNA. gRNA—RNA sequence that guides Cas9 to cleave a homologous region in the target genome. Efficient cleavage only where the gRNA homology is adjacent to a PAM. PAM—protospacer adapter motif, NGG, is a target DNA sequence that spCas9 will cut upstream from if directed to by the gRNA. donor plasmid. If creating a knock-in, clone desired gene into HR donor. using co-transfection for plasmids, co-transduction for lentivirus, or co-injection for mRNAs. SELECT/SCREEN: Select or screen for mutants and verify. VALIDATE: Genotype or sequence putative mutants to verify single or biallelic conversion. Note that this study uses a slightly different All-in-one Cas9 SmartNuclease Plasmid design, but the results are expected to be similar. Figure 1. Schematic showing knock-out of a genomic luciferase gene by insertion of an RFP gene. Cas9 activity and gRNA were delivered using an All-in-one Cas9 SmartNuclease Plasmid. To demonstrate the capabilities of our All-in-one Cas9 SmartNuclease Plasmids and also show how the choice of gRNA sequence can affect genome editing efficiencies, we designed a study to knock-out a genomic copy of a luciferase gene by inserting a copy of the RFP gene. This study used two different All-in-one constructs—EF1-hspCas9-H1-Luc-gRNA1 and EF1-hspCas9-H1-Luc-gRNA2—and an HR donor vector containing the RFP gene surrounded by sequences homologous to the DNA around the genomic luciferase gene (Figure 1). While both constructs enabled successful genome editing, as indicated by the recovery of RFP-positive clones, the construct with gRNA1 provided more efficient genome editing than the construct with gRNA2 (Figure 2). Figure 2. The All-in-one Cas9 SmartNuclease Plasmid enabled successful genomic luciferase knock-out and replacement with RFP. (A) Insertion of the RFP gene into the genomically-integrated luciferase gene results in a decrease in luciferase activity, indicating successful genome editing. (B) A Surveyor Nuclease Assay reflects finding from (A) that the gRNA1 construct delivered slightly more cleavage than the gRNA2 construct. (C) Fluorescence imaging shows successful genome editing by the recovery of RFP-positive clones.